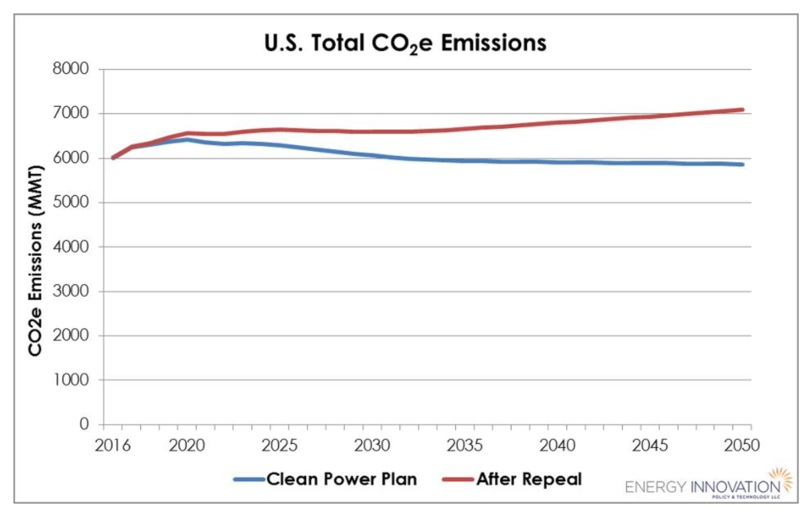 Repealing the Clean Power Plan would have significant impacts on the United States’ economy and the health of its citizens, according to new analysis from Energy Innovation, a clean energy think tank. Rolling back the carbon rule would lead to $100 billion in extra costs by 2030, rising to $600 billion by 2050, according to the organization’s power sector modeling tool. And the resulting impacts to air quality would lead to more than 40,000 premature deaths in 2030, and 120,000 in 2050. President Trump campaigned on rolling back regulations, focusing on energy production and undoing the CPP. He has now installed former Oklahoma Attorney General Scott Pruitt to lead the Environmental Protection Agency, and is preparing a budget that is expected to slash the agency’s finances and resources. In a piece of analysis contributed to Forbes, Energy Innovation’s head of modeling Jeffrey Rissman lays out the possible consequences of the United States abandoning President Obama’s signature climate regulation. The findings are based on Energy Innovation’s Energy Policy Simulator, an open-source modeling tool used to estimate the costs and benefits of various energy policies. The simulator’s models have been peer reviewed by scientists from the Massachusetts Institute of Technology, Stanford, Berkeley, the U.S. national laboratories, and two Chinese research groups. The Chinese government recently used a version of it to determine when it could peak power sector emissions. Though the tool has its limitations — it works using national averages, for instance — it gives a clear indication of what could happen to carbon emissions absent the rule. By 2030 the repeal would lead to an increase in carbon dioxide equivalent emissions of more than 500 million metric tons. By 2050, that figure rises to 1,200 million metric tons. Repeal of the Clean Power Plan would also allow more coal to persist on the U.S. grid. According to the simulator, the U.S. grid would feature 246 GW of coal capacity in 2030 if the Clean Power Plan was repealed and all else stays equal. That’s 55% higher than the 159 GW the simulator reckons would be in service in 2030 if the CPP was upheld. Repeal would also have detrimental impacts on wind and solar, according to the models. Wind capacity in 2030 would be 161 GW — 35% lower than with the climate rules — and solar would be 168 GW — 23% lower than if the CPP was upheld. Though market forces and other policy changes will likely affect the ultimate power mix and carbon emissions, the U.S. looks likely to head for a future similar to what the modeling describes. Trump is expected to issue an executive order this week repealing the Clean Power Plan, and the new EPA administrator has hinted that his agency may not look to replace it with another carbon rule.